As we move on in the series of top tens from the team at TouringCarTimes, the next topic is the best touring car racing moments from the races of the 2017 season. The list has been put together by our DTM correspondent Tamara Aller, who has reviewed some of the best moments from the past season. It was on lap eight of the TCR International Race 1 at the Salzburgring when Rob Huff’s front-left tyre exploded as he was approaching the Fahrerlagerkurve (Turn 12). Huff lost control of his Team WRT Volkswagen Golf GTI TCR, crashing into the barriers and rolled six times in the gravel trap, the first time he’s rolled a car in his career. Fortunately, the Briton escaped with just minor bruising. Ashley Sutton had been hunting down Colin Turkington in the BTCC points race, and the battle for the crown tipped in his favour at Rockingham, where a fine move on Jack Goff’s Honda on the final lap of race one gave the eventual champion a second-place finish behind Subaru team-mate James Cole. 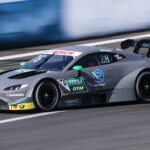 The trio of Marco Wittmann, Edoardo Mortara and Mattias Ekström were fighting for the final step of the podium on the last lap of the second DTM race at Norisring. 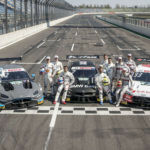 Coming to the final corner, BMW’s Marco Wittmann was in the slipstream of Audi’s Mattias Ekström, however, the reigning champion tagged the Swede with both going wide, opening the door for Mercedes’ Edoardo Mortara. The trio went side-by-side across the finish line, with Mortara taking his first and only podium of the year. 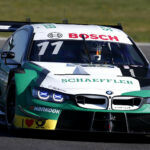 The start of the the second race at Oschersleben will be difficult to forget. M1RA’s Roberto Colciago, starting from third, moved to the left, hitting Team WRT’s Jean-Karl Vernay, who was squeezed between the SEAT of Craft-Bamboo driver James Nash. The Briton spun and collected WestCoast Racing’s Giacomo Altoé, who then spun across and into Rob Huff’s WRT Volkswagen who was then collected by Stian Paulsen’s SEAT and the Volkswagens of Rob Huff and Luca Engstler, whilst Nash’s team-mate Pepe Oriola also couldn’t avoid the out-of-control Colciago. Only Vernay from those involved in the incident was able to survive to take the restart. The two team-mates at Sébastien Loeb Racing went head to head in the opening race of the WTCC season finale in Qatar, fighting not only for the win but also for the independents’ title. On lap eight, the two team-mates were both side-by-side for most of the lap, with bodywork flying but absolute respect still shown by both drivers, with Chilton prevailing over Bennani. One of the most notorious touring car racing incidents of 2017 took place in the second DTM race at the Norisring. On lap 33, Mercedes’ Gary Paffett attacked Jamie Green, tagging the Audi on the main straight, but then lost control and hit the barriers. Paffett’s woes wouldn’t finish there, as the out-of-control Mercedes spun towards Turn 1 and collected Mike Rockenfeller’s Audi. Both drivers were able to walk away from the incident, but Rocky suffered a broken ankle, but this didn’t stop the 2013 champion from taking the title fight to the wire. Esteban Guerrieri made the most of his debut for Honda in the WTCC in Japan, engaging in a thrilling battle with Volvo’s Thed Björk for third place in severely wet conditions at Motegi in Japan. They made contact and overtook each other several times, with the Argentinian prevailing at the chequered flag, despite being more than sideways at one point in front of Björk’s S60. Fighting to keep his championship aspirations alive, Colin Turkington put on one of the most memorable performances of the decade in the BTCC, carving his way from 15th on the grid to take victory in the penultimate race of the season at the Brands Hatch GP circuit. Ultimately, the championship still went the way of Subaru rival Ash Sutton, after Turkington was taken out at the start of the final race of the year, but this drive kept the championship going, as it often does, right down to the wire. Dire conditions and poor visibility led to one of the most spectacular pile-ups in BTCC history during qualifying at Croft. 12 cars were involved in the massive crash. Three drivers were hospitalised, with Luke Davenport and Jeff Smith taking on further part in the season, although their injuries could have been much worse. The crash not only highlighted the advances in safety over the years, but it has also led to the implementation of further safety measures, with new trackside LED electronic warning flag signals set to be used from this season. ROAL Motorsport’s Tom Coronel was at the centre of one of the year’s most famous moments at the Vila Real street circuit. The Dutch driver suffered a front-left wheel failure on his Chevrolet Cruze in practice while braking into to Turn 23, and collided with a medical support vehicle. A barrier had not yet been installed which would have prevented the incident, and it was swiftly installed before the next session, but it was too late for Coronel, who wouldn’t take any further part that weekend.